AFTER THE referendum on nuclear energy held concurrently with nine-in-one elections on November 24th, shifts in Taiwan’s treatment of nuclear energy-related issues are likely to take place. The referendum called for the overturning of current provisions in the law which stipulate that Taiwan is to be nuclear-free by 2025. 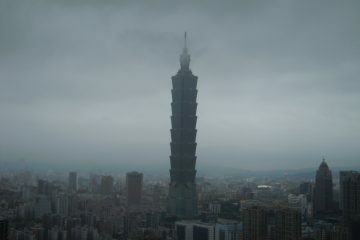 Although shortly after the referendum, the Tsai administration scheduled the restart of the No. 1 reactor at the Guosheng Nuclear Power Plant, this was not because of the referendum. The Tsai administration quietly approved reactor restarts for nuclear reactors including the Guosheng Nuclear Power Plant last year, but the No. 1 Guosheng Reactor was taken offline for scheduled maintenance last month. With the completion of this maintenance and the completion of safety checks after some initial failures, the plant was brought back online. In the meantime, the first reactor of the Jinshan power plant has now reached its scheduled decommissioning date, but questions remain on what to do with the nuclear waste from the plant. The second reactor of the plant is scheduled to be decommissioned next year. 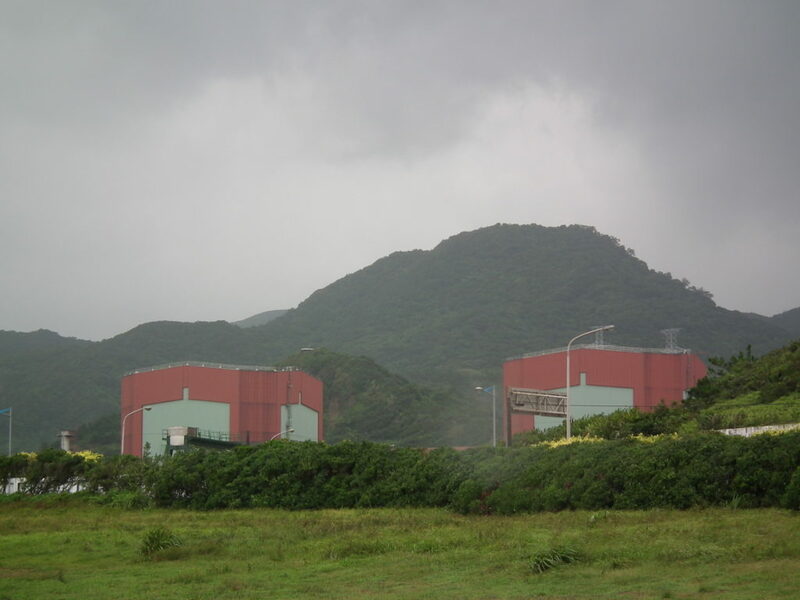 On the other hand, the Ministry of Economic Affairs has ordered Taipower to submit a request to postpone the decommissioning of the Ma-Anshan Nuclear Power Plant. It is also a question as to what should be done with nuclear rods from the currently shuttered Gongliao Nuclear Reactor, with the proposal that these rods should be shipped back to the US, but also calls from nuclear energy proponents to restart the reactor. 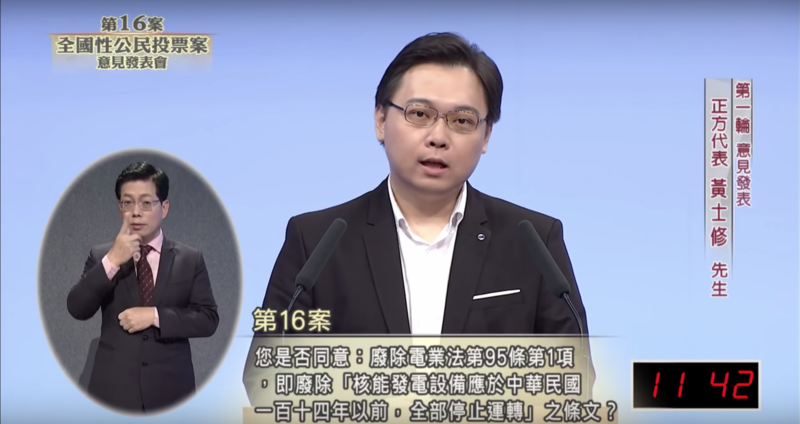 Another referendum question had asked Taiwanese voters whether they hoped to maintain current bans on food imports from areas of Japan affected by the 2011 Fukushima disaster. In particular, the Abe administration, which is strongly beholden to the Japanese nuclear lobby, has made accepting food imports from such areas a strong precondition for stronger diplomatic relations with Taiwan. This is part of efforts by the Abe administration to depict Fukushima as safe and to suggest that Japan has had no issues with returning to nuclear power after the Fukushima disaster. There are, of course, valid concerns with regards to whether such food is safe or not, seeing as the Japanese government was criticized for being reluctant to conduct safety assessments after the Fukushima disaster. 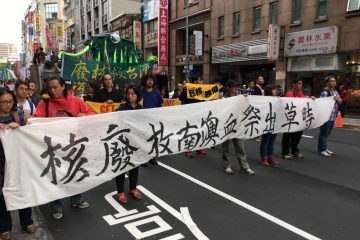 Yet the KMT has been an instrumental force in pushing for this referendum, with the hopes of sabotaging relations between the Tsai administration and Abe administration. Nevertheless, while the Abe administration has stated that it hopes that Taiwan will reconsider the food ban, it has indicated that it will more broadly overlook the issue for the sake of relations with Taiwan going forward. The overall energy policy of the Tsai administration going forward remains unclear. 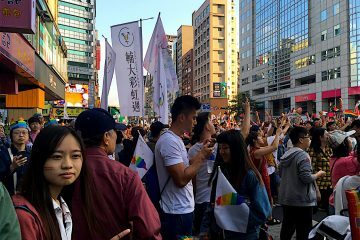 The Tsai administration has stated that it still intends to push for a nuclear-free Taiwan, just that after the referendum results, which are legally binding, it no longer has a deadline of 2025 to realize a nuclear-free Taiwan. On the other hand, the proponents of nuclear energy who pushed for the successful referendum in November, who have generally evidenced strong ties to the KMT, now call for a national referendum on restarting the Gongliao Nuclear Reactor. This is an unusual move seeing as some proponents of nuclear energy in Taiwan actually also oppose the Gongliao Nuclear Reactor, which is widely viewed as having a haphazard construction process. 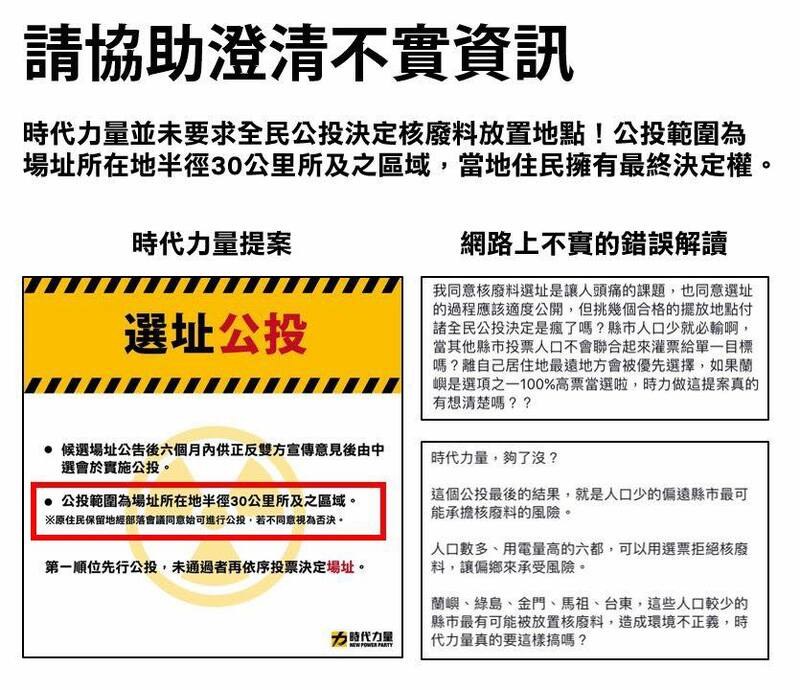 Furthermore, they call for a national referendum to be held on the unresolved question of where to store nuclear waste in Taiwan, including having a nationwide referendum on current nuclear waste storage sites in Lanyu. The NPP has, on the other hand, asserted that local referendums and a consultative process between civil society, experts, and the relevant government organs should be held to decide nuclear waste storage sites. This would be in order to prevent local residents of any given location from having nuclear waste storage sites built near their homes against their will. However, after making this proposal, the NPP was unexpectedly criticized by civil society groups because of the misperception that the NPP hoped to also hold a national referendum on the issue, rather than local referendums. This was mistakenly seen as not so different from what pro-nuclear groups called for in terms of seeking a national referendum and the NPP was criticized as fixated on the notion of holding a nationwide referendum, when this had resulted in widespread defeats for progressive civil society not too long before. 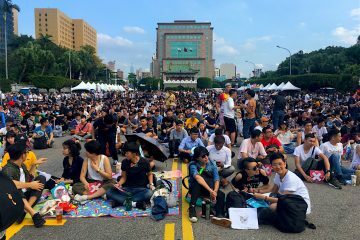 This may have originated in a deliberate spin against the NPP, as observed in misleading headline titles, but this backlash may also represent that progressive civil society groups have now become significantly more wary of holding nationwide referendums to settle key political issues. It continues to be that proponents of nuclear energy indicate strong ties to the pan-Blue camp, as well as that they are strongly beholden to the nuclear lobby in Taiwan. Indeed, in an examination of many of their arguments, one finds that despite the stereotype of nuclear energy opponents as being anti-science, in Taiwan it is more often than not proponents of nuclear energy who are anti-science. 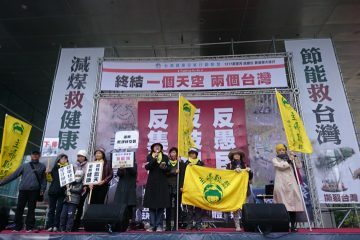 For example, Huang Shih-hsiu, a former legislative assistant of Hung Hsiu-chu of the KMT and the convenor of the referendum on nuclear energy, has proposed outlandish solutions to Taiwan’s nuclear waste issues such as every household taking in a small canister of nuclear waste so that the burden of nuclear waste is equally shared between all members of society. Huang has also claimed during a televised debate on nuclear energy that the Fukushima disaster was overblown, stating a belief that no earthquake had ever led to a nuclear disaster, and expressed strange views during televised debates on nuclear power such as that because nuclear power has been used in Taiwan for generations, the current generation has a commitment to their forebears to continue using nuclear energy. Still, misleading information abounds, which sometimes results in voting by the public on the basis of incorrect facts. A survey conducted by the Risk Society and Policy Research Center at National Taiwan University recently found that 44% of Taiwanese think that Taiwan’s energy mostly comes from nuclear energy when in 2017, only 8% of Taiwan’s energy came from nuclear energy. It remains a challenge to combat such perceptions in order to work towards sustainable future energy policy.